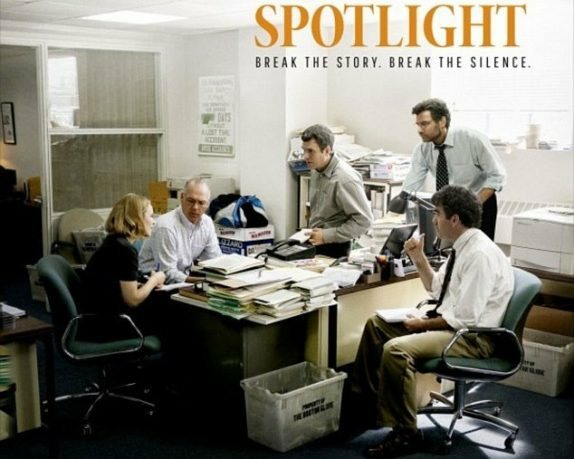 In his Boston Globe review, Globe writer Ty Burre vouches for the authenticity: “Tom McCarthy’s movie doesn’t turn its journalists into heroes. It just lets them do their jobs, as tedious and critical as those are, with a realism that grips an audience almost in spite of itself. … The office furniture seems unchanged since the 1970s, for one thing, and, trust me, that is realism.” For me, one of the most searing Spotlight moments is the sight of hundreds of thousands of newspapers containing the exposé as they pour off the presses — which doesn’t and will never happen in that quantity anymore — juxtaposed with the billboard for AOL outside the Globe’s printing plant. Globe reporters themselves tell their Spotlight stories here and, let’s not forget, in an actual book titled Betrayal .